The 26.7 metre sailing yacht Quinta Santa Maria, listed for sale by Bernard Gallay Yacht Brokerage, has been sold in an in-house deal. Built in GRP by Compositeworks to a design by Studio Besozzi Selvetti, she was delivered in 2002 to her previous owner as a fast cruising sloop. Her interior was fitted out by Mondomarine to accommodate eight guests in four cabins consisting of a master suite and three twin cabins, all with entertainment centres and en-suite shower facilities. In addition, there are quarters for four crew. She benefits from a large saloon with a sofa to port and a dining table to starboard along with a full entertainment centre including a Sharp flatscreen television and a stereo sound system. On deck she has two large cockpits, one for guest to relax in forward and the other for crew to work from aft. Deck gear includes no fewer than 12 Harken winches — six hydraulic and six manual, while her sail wardrobe comes with complete sets of Quantum racing and cruising sails. 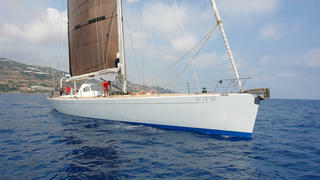 The 39 metre mast is by Hall Spars and she has a Park Avenue boom with a Reckmann hydraulic furling system. Under power, a 325hp Yanmar diesel engine gives her a cruising speed of 10 knots. Quinta Santa Maria was asking €790,000.